A contemporary 10-storey hotel in the city centre on the famous Corniche Road, close to the financial district and within walking distance of the latest modern shopping malls. All rooms have a breathtaking view of the Arabian Gulf or beautiful, landscaped gardens. 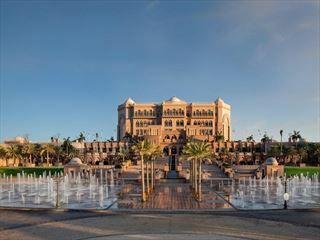 Hilton International Abu Dhabi offers a variety of restaurants and bars, with live entertainment to satisfy all tastes. Two outdoor freshwater swimming pools. BiCE Restaurant: Inspired by Beatrice (‘Bice’ to her friends) Ruggeri’s 1926 family kitchen, the BiCE serves traditional as well as modern Italian specialities on a level that meets perfection. Guest will like the modern and stylish interior with dark wooden flooring, black and white prints and comfortable seating while enjoying the welcoming ambience and exemplary service. BiCE is one of the top award winning restaurants in Abu Dhabi. Serving authentic Italian food for both lunch and dinner BiCE is hugely popular with in-house guests and Abu Dhabi residents alike. Vasco’s: Named after the well known discoverer Vasco da Gama, Vasco’s serves specialities from all over the world in a lively and welcoming atmosphere. Vasco’s received plenty of awards for its excellent kitchen and is one of the best and most popular restaurants in Abu Dhabi. Guests can dine inside or venture outside on the deck overlooking the Arabian Gulf. Mawal restaurant: Mawal serves traditional Lebanese cuisine in relaxing atmosphere. The perfect place to enjoy traditional Lebanese specialities during lunch or dinner. At night guests will be entertained with Arabian songs and belly dance. Royal Orchid Restaurant: Royal Orchid spoils its guests with an excellent choice of Thai, Chinese and Mongolian specialities in exquisite ambience. Escape Restaurant: Guests can enjoy excellent cocktails in relaxing atmosphere or international dishes while relaxing at Hiltonia Beach Club. Jazz BAr & Dining: A very popular bar in Abu Dhabi serving excellent Cocktails and dishes in a modern and welcoming atmosphere. A live band entertains guests every night. Hemingway’s: Serving typical South American dishes in relaxing atmosphere. A must is the menu with roast beef while enjoying life music. Sport lovers will enjoy the possibility of watching live sports games on TV. Vienna plaza: Café inspired by traditional Coffeehouses in Vienna with various coffee specialities and pastries. The ideal point to meet and chat while enjoying the relaxing and homely atmosphere. Toki: Sample a mix of modern and traditional Japanese cuisine in stylish Toki restaurant at the Hilton international Abu Dhabi hotel. Enjoy private dining or visit the sushi counter to watch the Japanese chefs prepare mouth-watering sushi and sashimi creations at this Japanese restaurant in Abu Dhabi. La Terrazza: Serving breakfast, lunch and dinner, La Terrazza Restaurant at the Hilton International Abu Dhabi hotel offers flavours from around the world and an outstanding view over the Corniche. Enjoy Italian and International theme nights, live cooking shows and delicious tasting sessions at this Abu Dhabi restaurant. Arabic Café: The open air beach bar at Hilton Abu Dhabi, is the perfect evening out with friends and family. Guests can gaze out over the Gulf and indulge in the Arabic favourites featuring hot and cold mezze and shisha with Arabic tunes in the background. 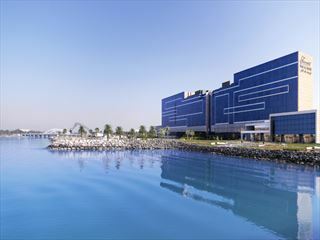 Cinnabar: One of the most popular hotspots in Abu Dhabi. With special theme nights, ladies nights and regular guest DJ’s, local and international this nightclub ensure a night to remember. While sipping on an exclusive cocktail, dance to the resident DJ, who spins every night his best repertoire of house, R&B, underground hip hop, lounge, trance, Oriental house, Arabic & International music.